The new expanded edition (2019) is available now! 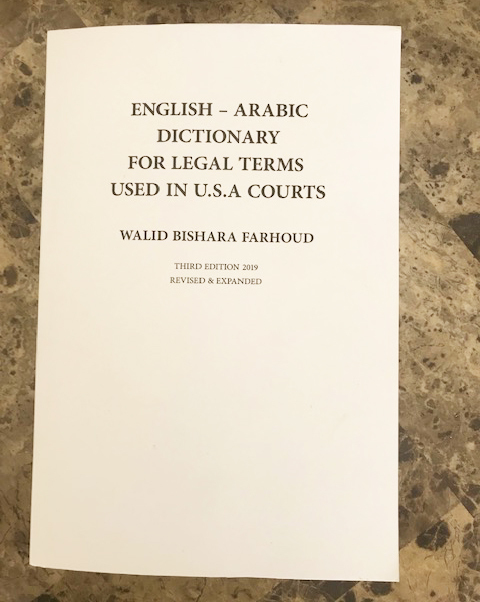 This Arabic-English dictionary was created to help translators, interpreters, judges, attorneys, students of law and any court officials in US courts. It contains over 5000 English terms with Arabic translations and usage. Created by a professional linguist, translator and interpreter who has provided services for the US Courts systems (Federal, State and Immigration) since 1980 with the intent to standardize the translation of terms in accuracy and precision. Walid B. Farhoud is the CEO of Middle East International Services, a professional translation and interpretation group in Arabic, Turkish, Hebrew and Farsi, designed for legal and commercial needs of US companies, law firms, governmental institutions and courts. He established the company in 1978 to perform translations, interpretation, media production, website localization, web design in Middle Eastern Languages, voice over, tele-conferencing, consultations and more. He also was an active lecturer at the University of Washington, Near East Department and at the Seattle University in Albert School of Business, doing business with the Arab World. I did receive the dictionary. I am finding it very useful and informative. Thank you for publishing it. I do appreciate the effort went into it. 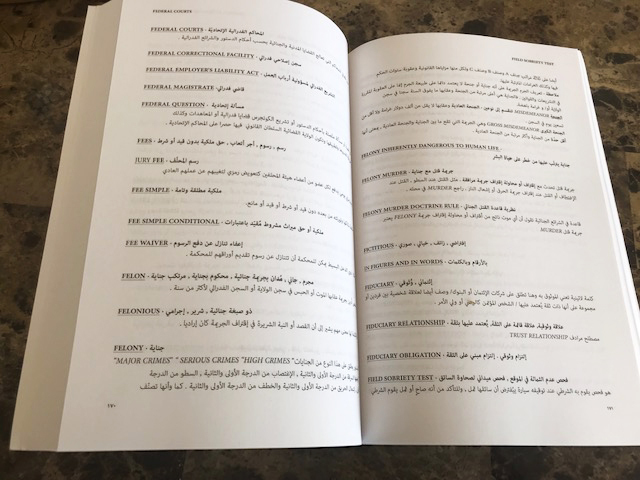 I do and will recommend it to all Arabic interpreters. Thank you so much for sending the copy. I am working on a piece of text for a current project right now, and it has already saved me time! I am especially pleased that it is a resource for American judicial language. It has given me some peace of mind since I can now count on finding valid expressions and turns of phrase rather than having to continually consult lawyers to validate or verify an expression. I eagerly look forward to the new edition when it comes out. I read about your new EN > AR legal dictionary and I would like to thank you for this big effort and I pray to God to grant you more and more success for your valuable efforts. I really admire your work, especially because it focuses on modern legal American terms. Our Arabic library has only few references in this regard. I hope that you are able to widely distribute your Dictionary as it will surely benefit us all. It looks interesting and worthwhile, and I commend you for the accomplishment. It is very impressive work and, I think, will be very useful to the courts. Mr. Farhoud, Congratulations and, on behalf of interpreters and non-English speakers, thank you! I received my copy of your "Dictionary of Legal Terms" in today's mail. It looks very interesting. Click here to pay securely online. SAMPLE PAGES: Click here to download a PDF sample of the dictionary.